Keeping teeth healthy during teeth straightening treatments is critical for the success of the overall process. If teeth suddenly begin suffering from decay or a patient is diagnosed with gum disease, it could be necessary to remove all or some of the braces so that these issues can be handled appropriately. That extends the treatment time and is incredibly inconvenient. It is far better for patients to know what they can do to keep teeth healthy and to make a point to follow a good oral hygiene routine. It may sound simple but brush, brush, brush. Instead of only brushing teeth at night and in the morning, brush after every meal or snacking episode. When wearing braces, food particles will easily become trapped underneath the wires and in between brackets. Once there, it can begin to secrete acid that will attack the enamel on the teeth. 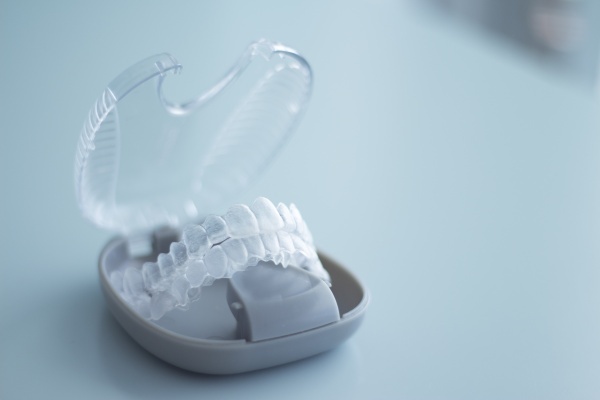 This leads to increased rates of tooth decay among patients who wear braces. Fortunately, it is easy to prevent this problem by merely brushing more regularly. Buy a dozen toothbrushes and keep them everywhere from the car, to the office, to the locker, purse, etc. During teeth straightening treatment, it will be necessary to carry a few extra oral hygiene items. Special tools make it easier to floss and remove food particles from in between teeth. Keep them with the toothbrush and use throughout the day. Floss is included in this as well. Be sure to floss a minimum of once per day. Drink water instead of sugary juice or soda. Water will help to keep the mouth hydrated, prevent dry mouth and work to wash away particles. It is good for the body and good for the teeth, so drinking more water is a win-win. Have teeth cleaned at least twice a year by a dentist. Some patients forget to do this when straightening teeth but now it is more important than ever. Anything that could cause the wires to break or brackets to become dislodged should be avoided. Let us give help by giving you more tips and tricks! To learn more about how to keep teeth and gums healthy during teeth straightening treatments, give us a call. We are happy to provide more tips and information, discuss various treatment options and help to create your most beautiful smile.